These are sample pictures as you will find them in the printed book (just in quite reduced quality here). The text underneath will be in the book too, but not right under the photo - that would spoil the riddle game for you and give it away too easily, right? Each photo has such an entry with additional information, but you will find them ordered by picture number, in the index after the map. If you would like to let your friends guess where these photos are taken, send them any of these photos as an eCard just by clicking the blue "Send as eCard" under each photo. For additional photos, which are not in the the printed edition of the book, please check out the Home Page, I will post some there over time. 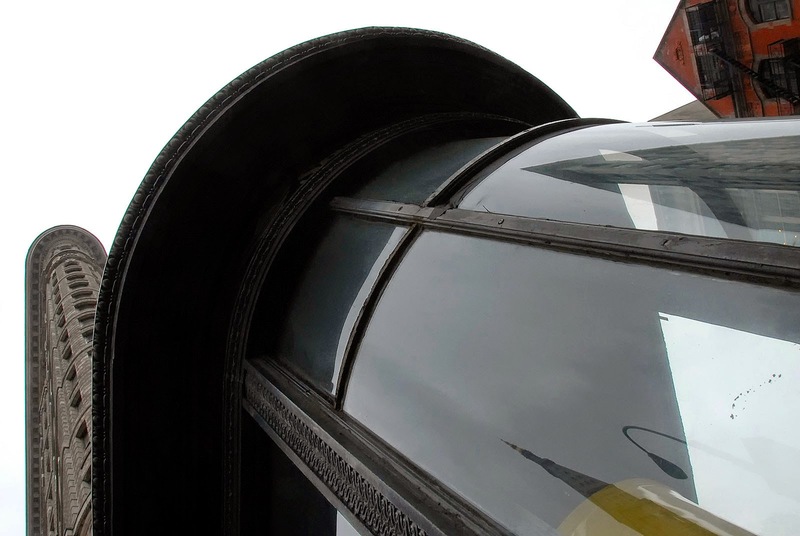 The roof of the Astor Place–Cooper Union subway entrance kiosk — built in 1904 and reproduced in 1986 — plows through the sight of the “Sculpture for Living” Building. 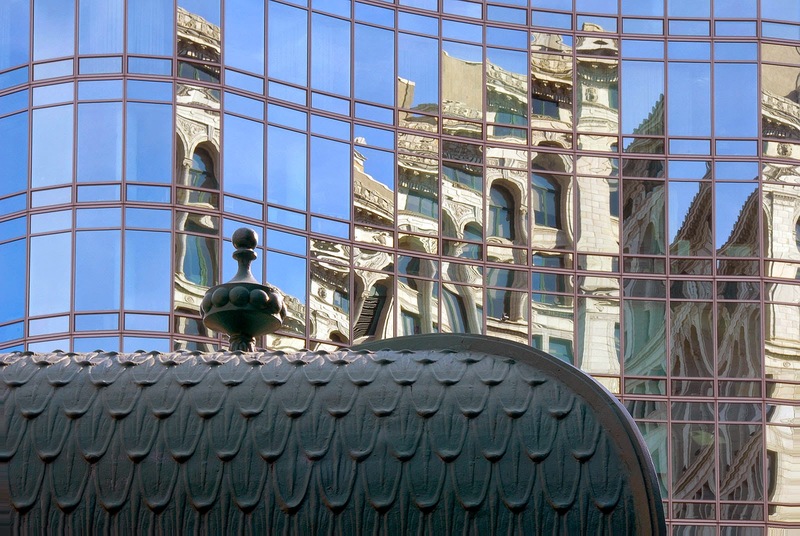 The glass façade mirrors the Wanamaker Building, a former pioneering department store. Astor Place is home to Cooper Union, an engineering, art, and design school that offered free education until 2014; in past years it has hosted such famous speakers as Abraham Lincoln, Mark Twain, and Bill Clinton. The area has undergone an enormous transition in the 2010s: the former Wanamaker Building now serves as headquarters of the AOL/Huffington Post Media Group, Facebook is on the way in, and the IBM Watson Group is about to move into a huge, shiny building right opposite that the local community has nicknamed “the Death Star.” Editors of the Wall Street Journal got so confused in 2013 that they called the area Midtown South. Arturo Di Modica created Charging Bull in 1987 as a sign of the “strength and power of the American people” and placed it — guerrilla style — under a Christmas tree in front of the New York Stock Exchange. The police seized it and towed it to an impound lot, but public outcry induced the city to install it at the north end of Bowling Green Park. 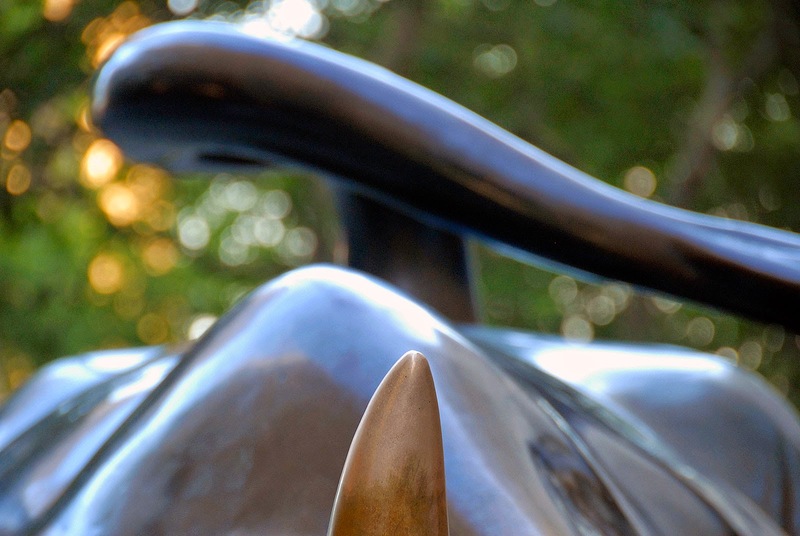 People think polishing it may bring them luck: “Passersby have rubbed — to a shiny gleam — its nose, horns, and a part of its anatomy which separates the bull from the steer,” the New York Times noted in 2004. A girl with shopping bags rests in front of the Revson Fountain, the centerpiece of Lincoln Center’s main plaza. Initiated in the 1950s by a civic consortium led by John D. Rockefeller III, the center’s three main buildings are the Metropolitan Opera House, the Avery Fisher Hall (formerly Philharmonic Hall) to the north, and the David H. Koch Theater (formerly the New York State Theater) just to the south. Today Lincoln Center features 29 indoor and outdoor performance facilities and 11 resident arts organizations. The view from Brooklyn, straight across the East River into John Street and thus right into the thicket of Lower Manhattan’s Financial District. The masts of the museum ships Wavertree (in white, on the left) and Peking invoke a time when they were the tallest structures here. Once, hundreds of sail ships berthed at the numerous Manhattan piers. 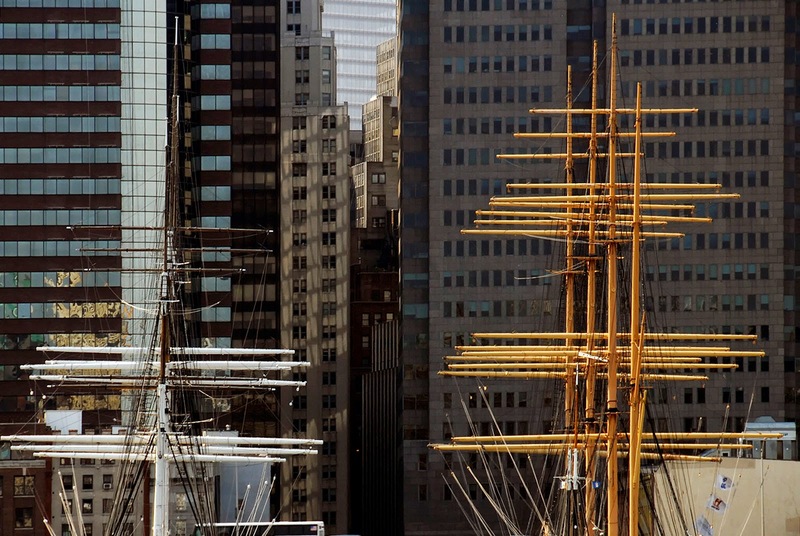 Even after the time of the windjammers, Manhattan kept a working waterfront. It is estimated that in 1948 the Mafia was in full control of all 906 piers in the Port of New York. The Waterfront Commission of New Jersey and New York started in 1953 to work against the Gambino family on the Manhattan shoreline and the Genovese family on the west side of the Hudson — one year before Marlon Brando starred in On the Waterfront. Due to its geography and shape, strong winds around the Flatiron Building often blew up women’s dresses, inspiring early-20th-century policemen to shoo away would-be oglers with a brisk “23 Skidoo!” Enthusiastically embraced by Manhattanites since its 1902 creation as the Fuller Building, this unusual icon was built as a Renaissance palazzo with Beaux Arts styling on a triangular footprint. 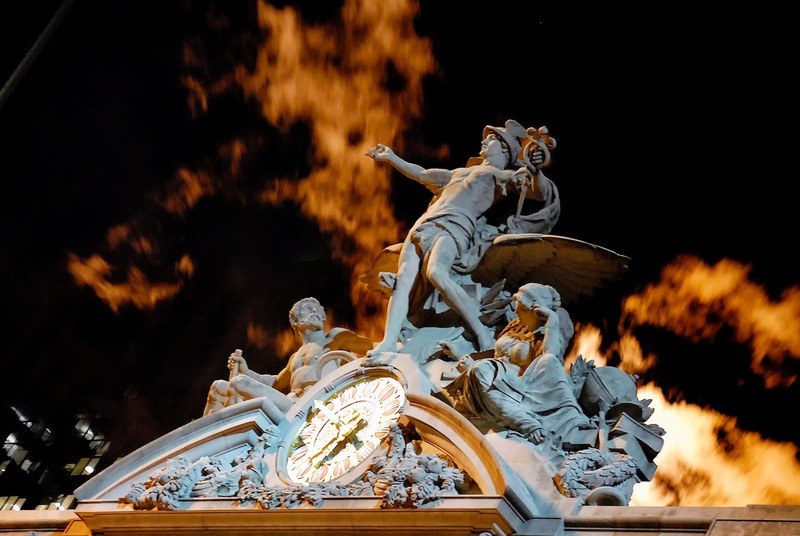 Mercury is the Roman god of travel, business, and wealth, but he patronizes other departments as well: eloquence, poetry, communication, divination, transitions and boundaries, luck, mischief, and thieves — and at the very end, he conducts souls to the afterlife. Here accompanied by Minerva and Hercules, Mercury commands the position atop Grand Central Terminal’s façade on 42nd St facing Park Avenue. Jules-Félix Coutan, creator of the marble group, never set foot onto American soil. Instead he sent a model from Paris, where he was an academic sculptor — who sneered at Auguste Rodin and the impressionist sculptors who deliberately ventured beyond the limitations of academic art. The massive group — arranged at a length of 60 feet and a height of 50 feet in about 1,000 tons of marble from Bedford, Indiana — was built section by section, layer by layer, from 1911 to 1914 by William Bradley & Son, based in Long Island City. 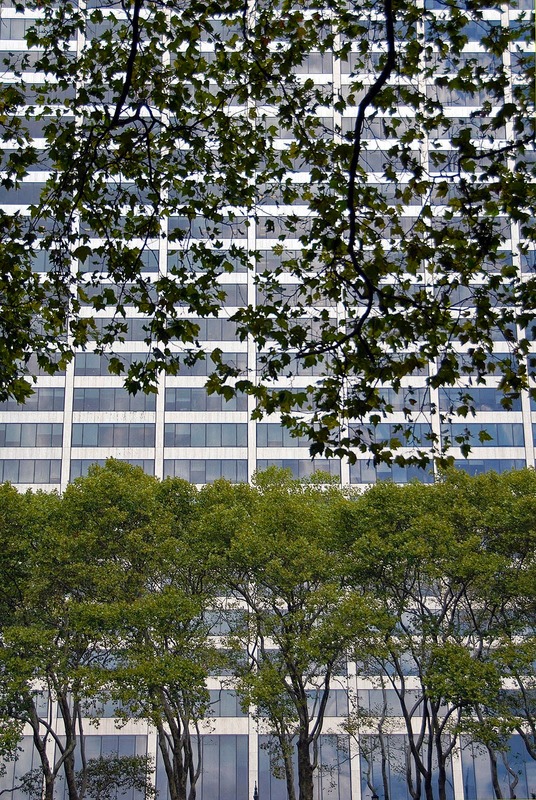 On the northern edge of Bryant Park, the W.C. Grace Building looms over 42nd St with its concave façade. The AIA Guide to New York City calls it “flashy” and “a disgrace to the street.” It seems to have been as badly received by architecture lovers as the similar Solow Building at 9 W 57th St. Bryant Park these days is not only an office worker’s open-air lunchroom but also the location of numerous events such as outdoor movies on summer nights and Manhattan’s biggest ice skating rink in winter. Its origins are modest, having started out in 1823 as a potter’s field. The New York Crystal Palace stood here for a mere five years before burning down in 1858. In 1911, the New York Public Library’s main building replaced the Egyptian-style Croton Reservoir, built here in 1842. 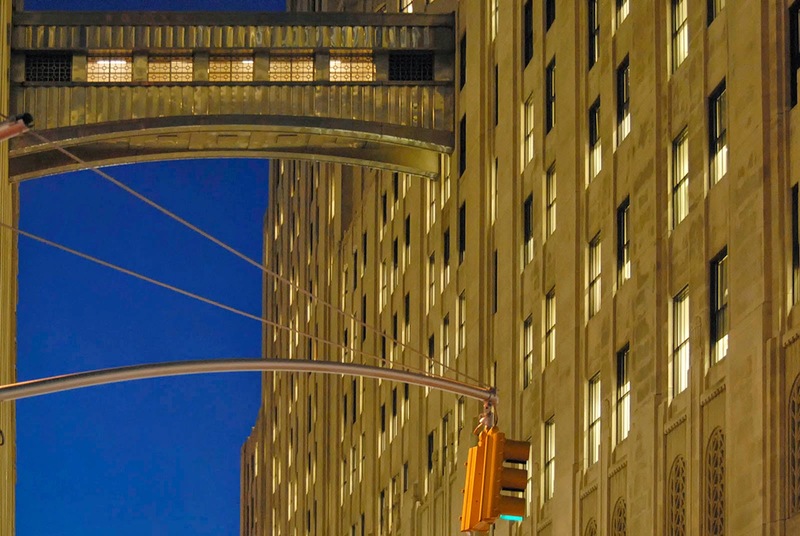 A sky bridge connects the two buildings of the Metropolitan Life Insurance Company on Madison Square. The older South Building, dating back to 1893, was replaced in 1953–57. Its addition, the 1909 tower, modeled after the Campanile at St. Mark’s Square in Venice, held the record at 700 feet as the world’s tallest building until 1913. Unfortunately the rich ornamentation got stripped off in 1964. The Great Depression brought plans to replace the northern annex building with a 100-story tower to a screeching halt. Instead, a beautiful polygonal 32-story tower in Art Deco style was completed in 1950, with 30 elevators and the structural strength for 100 stories. 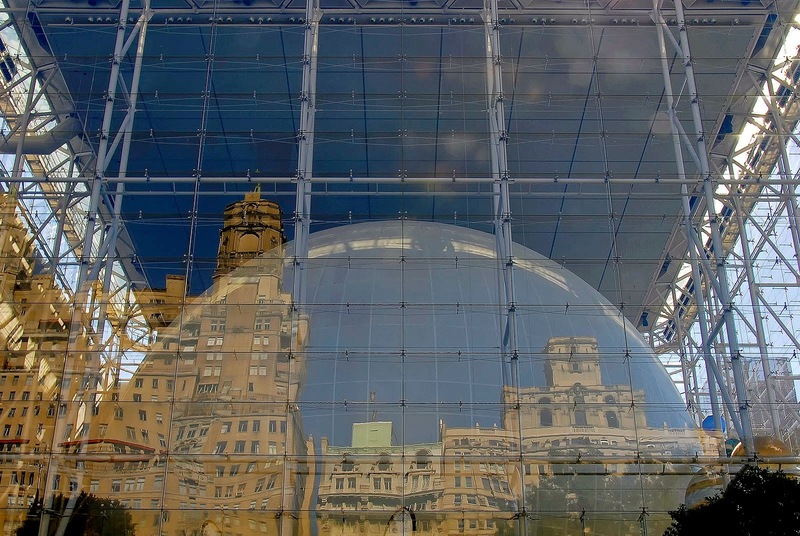 At times, the sphere in the Rose Center for Earth and Space at the American Museum of Natural History looks like a pickled egg floating in a jar. The glass façade mirrors to the left the Beresford on W 81st St, a 1929 achievement by Emery Roth that has two outstanding features: it is one of the first apartment buildings with elevators leading right into the apartments instead of into a hallway, and it features three rather than just two towers, unlike the Eldorado and the San Remo, Roth’s other luxury apartment buildings on Central Park West. Pale Male, the famous philandering red-tailed hawk, temporarily switched from his main residence at 927 5th Ave in 2005 and spent some nights here. Manhattanhenge — named after the spectacular sunset at Stonehenge in the United Kingdom — happens twice a year. The setting sun aligns with the not quite east-west direction of Manhattan’s cross streets, here seen along 33rd St and the Empire State Building. 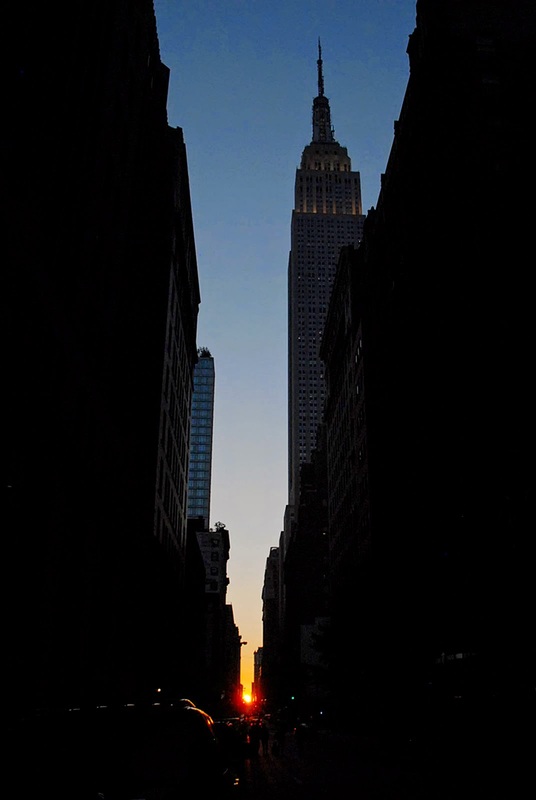 Cross streets following the Commissioners’ Plan of 1811 are laid out in a grid offset 29.0 degrees from true east–west — meaning that Manhattanhenge usually falls around May 28 and on July 12 or July 13 — on either side of the summer solstice. 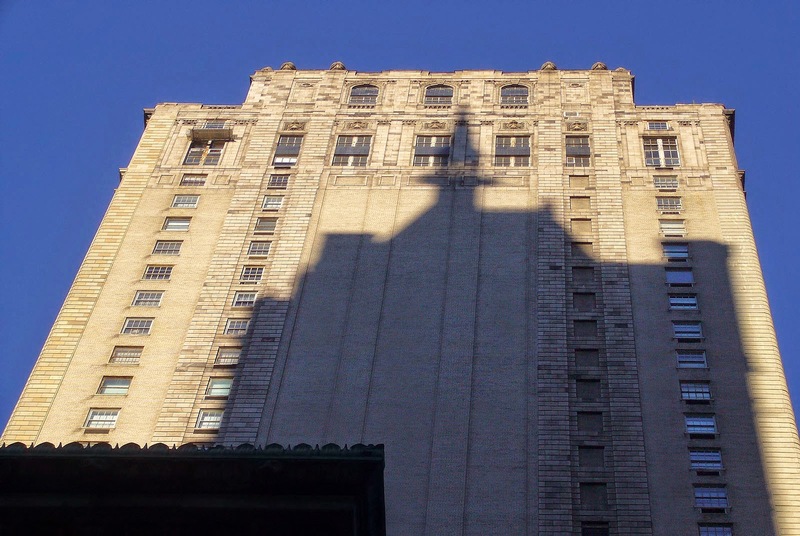 The silhouette of the Sherry-Netherland tower leaves an impression of this neighborhood’s luxury on the southern wall of the Pierre, a luxury hotel at 5th Ave & E 61st St. “A tower fit for a muezzin” quipped the AIA Guide to New York City. Though quite different, both buildings were designed by Schultze & Weaver; the Sherry-Netherland in 1927, the Pierre in 1929. Each is home to a hotel as well as apartments. 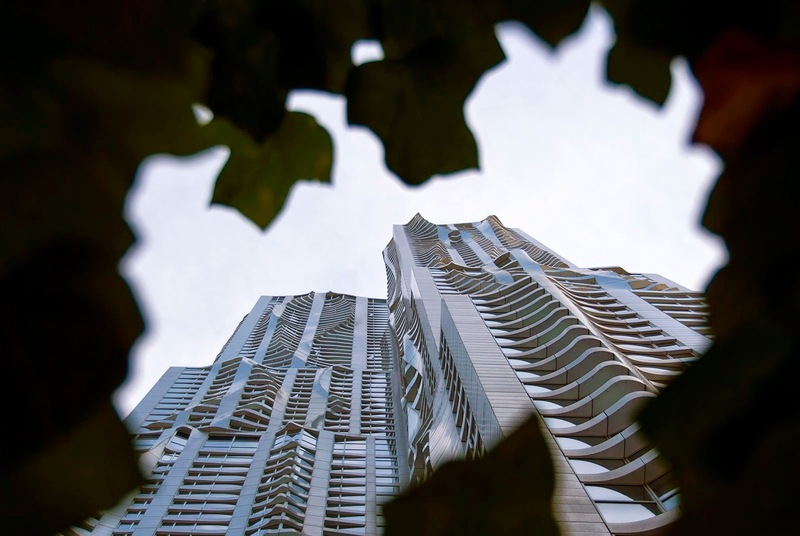 “Gold Coast” seems to be an apt name for the area: the Sherry-Netherland‘s 18th-floor penthouse went on the market in 2012 for $95 million — and is still available at this price as of January 2014. 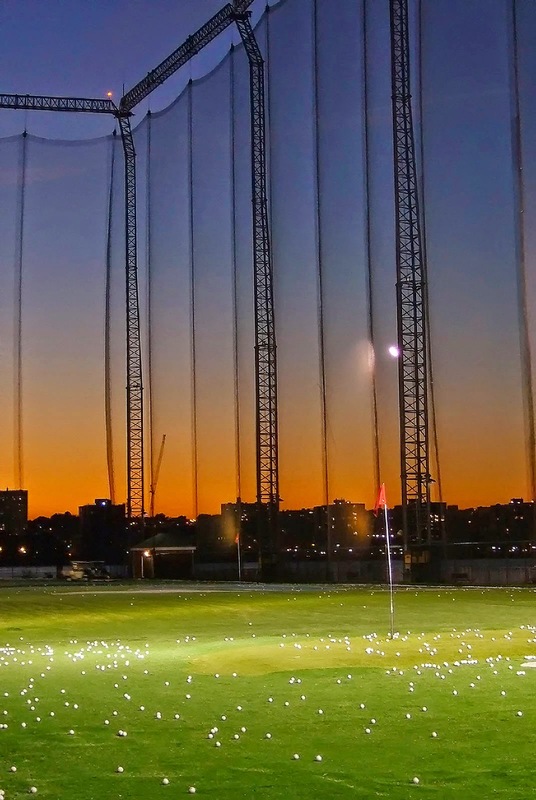 The sun sets over New Jersey while golfers drive balls from four levels on the converted Pier 59, a 200-foot-long turf fairway, toward the Hudson River. The large net saves boaters from being hit by errant balls. There are facilities here for bowling, ice hockey, swimming, indoor-wall rock climbing — or simply docking your yacht outside at the open-air bar. Ok, thats it for now. If you are curious to see all 144 photos, you might consider purchasing a copy of the book. It would be a pleasure, not just for me. I promise, you will enjoy it too. These photos are heavily reduced in size and quality, since they serve only the purpose to be shown on the web. The print quality is far superior. Can I get a print out of the book - or other prints - from you, for that matter? Sure you can. Just get in touch with me here through the contact form and we figure something out. Unfortunately, Janko's webpage www.jankopuls.com is currently under renovation, but should be back very soon with an improved print order system. Bad timing, I know! You can find my photography on several social platforms. Just browse around and have a look. If you are interested in a print: Just email me! Facebook - Point of View New York City on Facebook!